Being a transcription of an article that first appeared in "Mardles" magazine, 1999. [Editor's note: what follows is an unedited and unaltered copy of a magazine article describing the early years of the Morris Men of Little Egypt. References to "now" or "last year" etc. therefore have to be read in that context and the article does not (necessarily) refer to the present state of the side. © Steve Clarke 1999, 2018. If Morris Dancing is really only a product of the romanticism of the arty classes of the late 19th Century, then its late 20th Century resurgence belongs to the beery groups of rural wannabees who grew up ot Sandy Denny’s rendition of "Matty Groves" and matures with innumerable pub renditions of “Wild Rover” or "The Holy Ground" – “Fine gel ye are” – and badly-played penny whistle. So let it be with the Morris Men of Little Egypt. It would be nice to claim that our roots lie in some Arcadian idyll, of rosy-cheeked maids and muscular swains. Unfortunately the truth is more prosaic, lying rather in the realms of the demands of a church fete and the presence of like-minded farmers, meat-processors, double-glazing operatives and school teachers (alongside a selection of other modern occupations). The present Morris Men of Little Egypt can, however, at least claim to be part of a revival – possibly the shortest in Morris history. 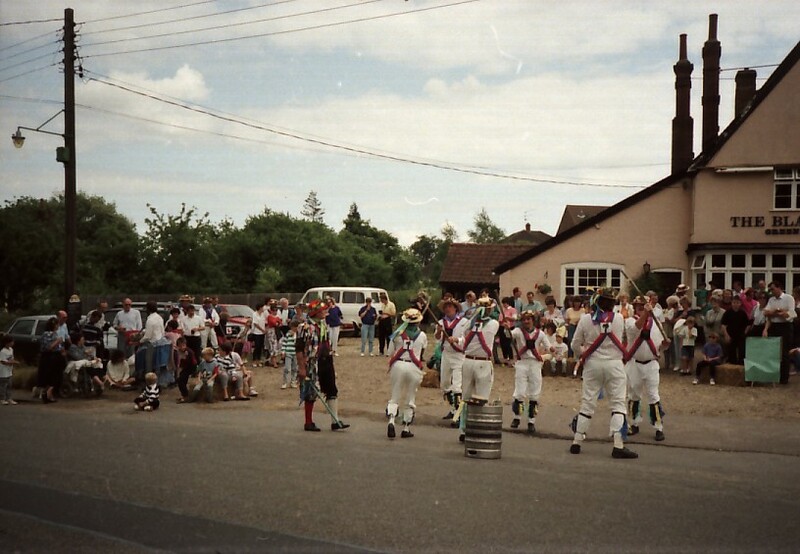 Our first incarnation happened as early as 1989, when a small group of recruits met under the expert tuition of Fred Sanders and John Aldous (of Belchamp Morris) to learn a few dances to entertain the at that year’s church fete in our home village, Glemsford, nestling in its own oasis of calm and tranquillity above the twin valleys of the Stour and Glem, in Suffolk. As a result of our ecclesiastical exertions, several of us tried to keep the side running, visiting Belchamp (across the Essex border) on a semi-regular basis for extra tuition, but in the end, that effort lost momentum, and fizzled out. A revival came in 1992, when Fred and John were again approached to provide entertainment for the annual church fund-raising exercise. Some of the recruits for the reincarnation were from the side of ’89; apart from Fred and John: Neville Parry, Peter Ford and Steve Clarke again offered their services, along with other stalwarts such as Geoff Monk, Derek Southgate and our import from the colonies, Lt Col. Bob Farmer from Tennessee via the USAF and Mildenhall. We also agreed the name: Morris Men of Little Egypt. Why? That’s another [well-rehearsed] story. It is amazing how quickly traditions can be established. We are Men of Glemsford. Even now when people flock from far and nearly-Norfolk to be with us, we have maintained the requirement that more than 50% of our members must live in the village. We celebrate May Day with a dawn dance at Park farm (where we practise – thanks to Peter Ford). We dance outside the Black Lion every Boxing Day. We sometimes struggle to dance with perfect step and caper. At that first general meeting, Neville Parry was elected Squire, the position he has held ever since. 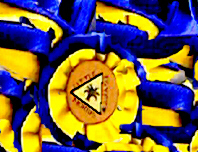 We decided early on that our side’s colours would be “three blues and a yellow”, shown on baldrics (actually crossbelts) and bellpad. 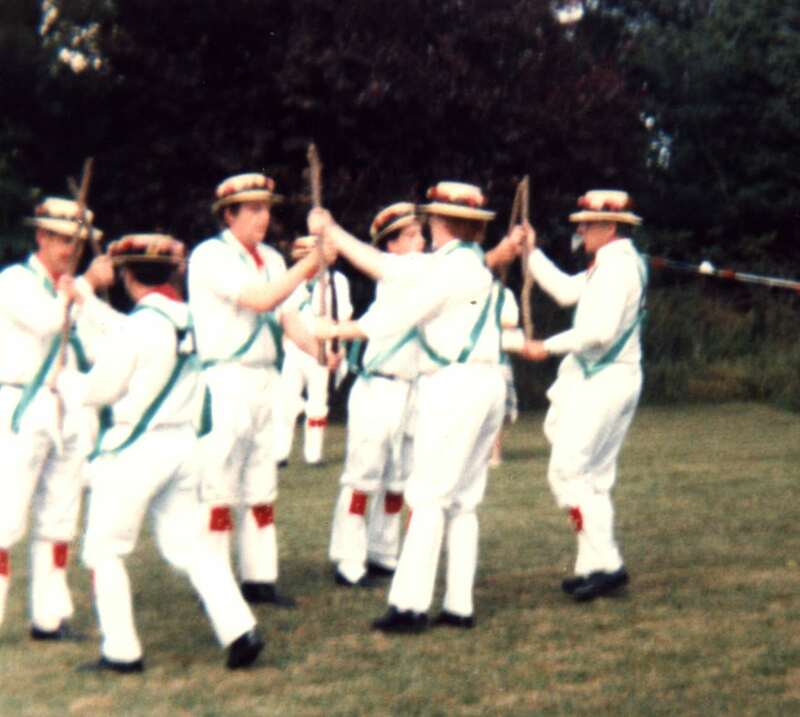 As we claim to dance in Cotswold style, we wear also the traditional white uniform, a range of coloured waistcoats, neckerchiefs and flowered straw hats. There is some variation in this kit, allowing for expression of individual taste, and the availability of material. We have also become quite well known for our alternative uniform, which comprises an imitation of Victorian farmworker’s dress, namely dark trousers and boots, collarless shirt, plain waistcoat and headwear (top hat, bowler, cap). This kit was first devised when we became involved in a series of excursions with Steam Engines. On at least two occasion, we took delight in travelling behind a group of traction engines, dancing wherever they stopped which, surprisingly often, was at a pub. We realised early on that our Cotswold whited would be ruined by the exhalations of the giants of the road, so we adopted the darker kit which was, early on, christened our Oily Smuts kit. For “Oily Smuts”, read “Horkey”. This variation of kit has now become our official uniform for another tradition, the annual celebration of the Suffolk harvest, the Horkey. On this occasion we “dance” a horkey-bough through the village before holding an evening’s entertainment and supper in the Village Hall. Oily Smuts tours represent another facet of the Life of Little Egypt: activities beyond pub dancing and outside the village. In our second year, we agreed to dance again at the church fete, but wanted to do more than just turn up. So we organised our Tractor and Trailer Day. This involved rigging out one of Peter’s farm trailers in appropriate fashion, hitching it to a tractor and setting off to visit surrounding villages, normally Cavendish (which has several pubs). Good fun, and worth repeating. The second Oily Smuts tour developed that idea further. We have also travelled further afield. One year, we visited and travelled along the Norfolk Broads. Last year we took to the rails, dancing at each station on the North Norfolk Railway, as well as on Sheringham sea front. Not being content with these domestic jaunts, Little Egypt has also made two ventures into the Hessen area of Germany, thanks to a friendship with a folk-dance group there known as the Hoingker, and last autumn saw the side descending on Galway in Ireland for a weekend of dance, song and stout. Mention of song takes me to the issue of music. Little Egypt’s is now s strong musical side. When we started, we depended on Fred for his trusty melodeon work. Roger Newman also came along with his accordion. Fred made it clear early on that he did not want to become a regular part of the side, because of the demands on his time, so we had to search elsewhere. Roger, too, was unable to be with us all the time. Alex Clarke, at the tender age of 14, helped out with some cultured fiddle playing, including on one occasion playing for a whole session on her own. Sometimes we had to rely on other sides to help us out. We put out feeler for interested participants. And how we blossomed! Mark Mikurenda came all the way from Dorset to be with us, and to teach is a lot of dances. Martin Barratt arrived to bolster further the melodeon work. For a while, Barry Watson (‘til recently of Mardi Pas) contributed both accordion and a range of penny whistles, incredibly skilfully. Bob Farmer developed his expertise on the whistle, and Pippa Clarke came along with recorder and occasional trombone. Another addition has been the strangely-shaped bazouki-style instrument of Julie Thomson. Percussion there is in plenty, sometimes welcome, sometimes not: our side drum can be very loud. As well as close-season mumming at Christmas, our après-danse entertainment includes a wide variety of songs, ranging from coarse songs about dubious rustic morals, often involving William and Nancy, through rousing hornpipes and community singing, to full operatic arias as purveyed by James Meek. These latter tend to bemuse the other sides we dance with. They don’t seem to understand. Some people don’t seem to understand Little Egypt at all.